Our cruise packing list will have you set for whatever kind of cruise you’re about to embark on. We’ve been on a dozen cruises and can now teach you exactly what to pack for a cruise! 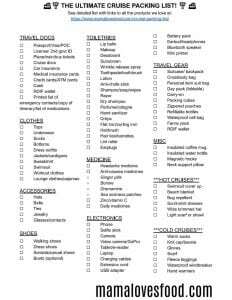 A cruise packing list is just what you need to make packing for a cruise simple and easy. 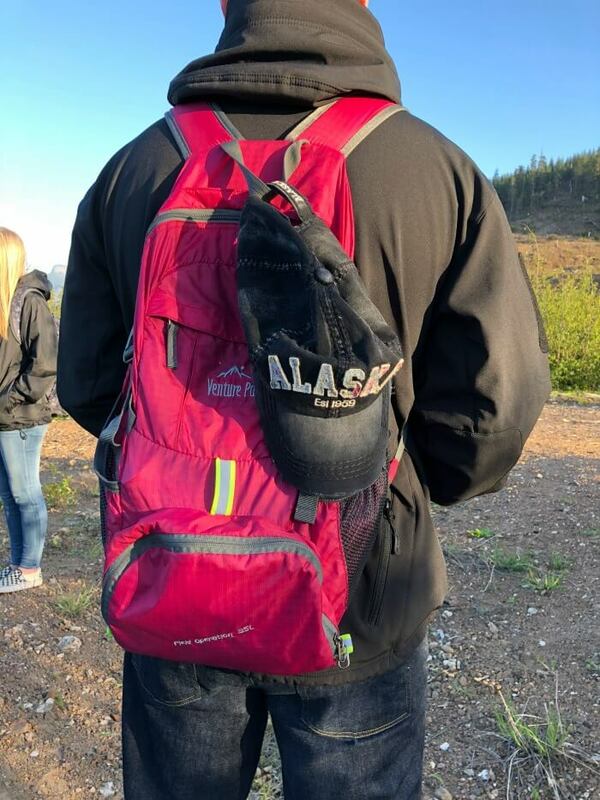 We will walk you through what to pack for a cruise in this article – including what to pack for an Alaskan cruise, and what to pack for a Caribbean cruise! We recently took a cruise to Alaska with Princess Cruises and had the trip of a lifetime! If you love exploring the world as much as I do, make sure to check out all our travel posts and cruise inspired articles! 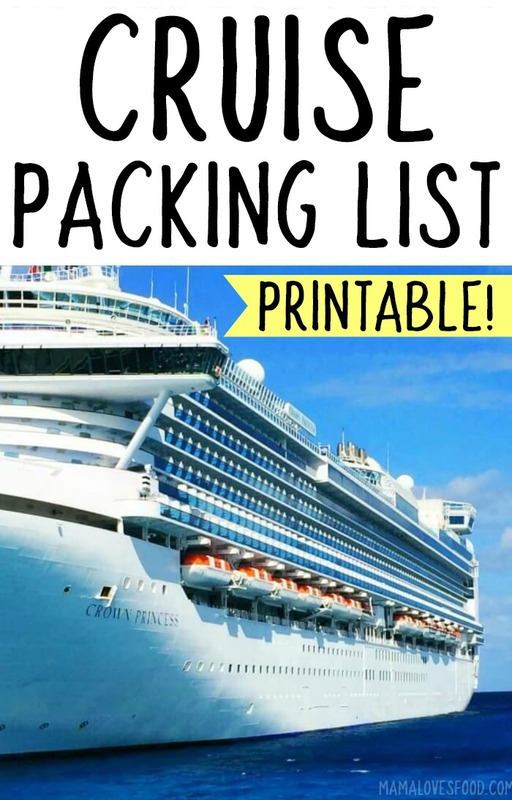 This cruise packing list is published in partnership with Princess Cruises. All content and opinions belong to Mama Loves Food. If you bring nothing else, bring these things. This is the most important section of the cruise packing list – everything else can be purchased when you get there. I like to bring paper/physical copies, but also take pictures of everything and keep it on my phone. Passport/Visa/Proof of citizenship – Some countries require both a passport and a visa, check your itinerary and figure out exactly what you need. Drivers license or other government issued ID – If you’re going to drive at all while in port, you’ll need your drivers license. That said, you should always have a second government issued ID with you. Plane tickets – Don’t forget these! I like to print a paper copy and also keep a digital copy on my phone or in my email. Cruise docs – You need your cruise docs to get on the ship! Don’t forget them! I like to print two copies. One for my pocket and another in one of our bags. Just in case! Car insurance – You’ll need this if you plan on driving or renting a car while in port. Medical insurance cards – The last thing you want is to get sick or injured and have trouble getting treatment because you forgot your insurance cards. Credit cards/ATM cards – We prefer to pay with credit card wherever possible when traveling for a few reasons 1. your purchases are protected and if it gets lost or stolen it can be cancelled, 2. you get points for your purchases!, and 3. they do automatic currency conversions for you. After our last trip we actually got a credit on our statement because they were able to adjust the conversion rate down. NOTE – don’t forget to call your bank and cardholders to let them know you’re traveling. Cash – I legitimately forgot to bring cash on my cruise to Costa Maya Mexico last November. Thankfully my aunt had her head on straight and brought enough for both of us! If you’re visiting small isolated towns there’s a good chance it’s cash only. And don’t forget to get local currency, not everyone takes American dollars. RDIF wallet – Keep your important cards in an RDIF blocking wallet to keep thieves from remotely stealing your information. List of emergency contacts/copy of itinerary/list of medications – Just make sure you’ve got all the important stuff written down somewhere. Both physically and digitally. There’s nothing worse than losing your phone in the ocean and realizing it has all your important info on it. The clothes on your cruise packing list should be light and layerable. Think camis, t-shirts, cardigans, leggings, pants. There’s no need to pack a full outfit for each day when you pack items that can be mix and matched and layered! And remember, cruise ships have laundry services if you need them. Tops – 1 top for each day, plus two extra. Underwear – 2 bras (one light, one dark), one pair of underwear for each day, plus an extra pair for each day you have an excursion scheduled. I also like to pack one or two neutral colored camisoles to wear under t-shirts. Socks – one pair for each day, plus two extra. Don’t forget pantyhose if you need them for formal nights. Bottoms – at least two, but otherwise no more than half as many as days you are cruising. (e.g. for a seven day cruise I would bring 3 bottoms). Dress outfits – at least one. If you have more than one formal night you can bring two, but I prefer to bring one that can be layered with shawls or jewelry to look different. I have a simple black dress like this one that is easily dressed up or down with accessories. My husband brings one suit and two different colored dress shirts. Outerwear/jackets/cardigans – one or two cardigans and/or shawls for women (I love this pashmina, or this beachy striped cardigan). A windbreaker (even on Caribbean cruises!) or light jacket, for both men and women. Sweatshirt – A good old fashion sweatshirt is nice to have when you travel. I also have this super comfy sweatshirt material poncho that I love. Swimsuit – at least one swimsuit (even for Alaska! ), and two if you’re cruising the Caribbean, Hawaii, or the Mediterranean. Workout clothes – one set of workout clothes if you’re going to hit the gym. Two if you’re planning to go several times. Lounge clothes/pajamas – I like to pack one or two sets of lounge clothes that will double as pajamas. CHECK OUT TRAVEL FAVORITES IN OUR AMAZON STORE. Hats – I always bring a baseball cap for myself and one for my husband. We velcro or snap them to the the top of our carry-on backpacks. It’s nice to be able to shade the sun or hide your deck hair! For beach trips I like a big floppy hat as well, and for cold weather trips a knit beanie. Belts – One belt each should be plenty – this reversible one for him is great, and one for her too of course, so you can match everything! Ties – Seems obvious, but we’ve been in the gift shop hunting for ties before! Bring a reversible tie so you only have to pack one. Jewelry – I like to bring a few fun pieces of costume jewelry to dress up my little black dress. I’m partial to the $5 stuff because if it breaks or gets lost on the trip, it’s no big loss. Glasses/sunglasses/contacts – don’t forget these, if they’re prescription they’ll be hard to replace on a trip! Make sure to bring extra. It’s incredibly important to include comfortable shoes on your cruise packing list! On our cruise to Alaska I forgot my sneakers and was miserable until I finally broke down and bought a pair in the cruise gift shop. Walking shoes – a comfortable pair of walking shoes that have plenty of padding and won’t give you blisters. Don’t pack something you’ve never worn before! Dress shoes – I like to pack a pair of neutral flats that can go with all my dinner outfits. Remember, the ship rocks! Heels can be tricky. My husband also packs a pair of neutral shoes that will go with his dinner attire. Sandals/casual shoes – I also pack a pair of flip flops for making quick trips to the buffet or for lounging by the pool. They’re also great to stash in your day pack if you’ll be hitting the beach on our excursions. Boots – these are very optional. I’ve never been on an excursion where they are necessary (sneakers have always sufficed), but if you will be doing a lot of hiking, boots might be something to consider. The toiletries you pack for your cruise shouldn’t take up more than one or two medium sized zipper pouches. And remember, if you’re flying to the port city, you will need to put your liquids in a bottle less than three ounces and keep them in a clear plastic bag. Lip balm – I don’t know what it is about traveling that makes my lips so dry, but I always travel with a few tubes of chapstick. Makeup – if you wear makeup, take a look at what you really wear on a day to day basis and only pack that. There’s not a lot of room in cruise ship bathrooms! Makeup is the last thing I pack and I only bring what I used the morning we leave. If I didn’t need it then, I won’t need it on the ship! TIP – rather than bringing nail polish that can make a mess, try press on nails. I’m addicted! Deodorant – do us all a favor and pack this! Sunscreen – a must have for cruising anywhere. Wrinkle release spray – this wrinkle release spray is the best thing that’s happened to packing since suitcases. It’s great for getting wrinkles out of clothing, but also refreshes them so you can wear a second time! Toothpaste/toothbrush/mouthwash – I usually buy travel sized or something from the dollar store and leave them behind at the end of the cruise. One less thing to pack on the way home. Lotion – the interior air on planes and cruise ships tends to be dry, so a small bottle of lotion is a great thing to have on hand. Anti-chafe stick – If your thighs kiss, but you like wearing shorts and dresses, this anti-chafe stick is an absolute hero. I never travel without mine! Works well for any part of the body that sweats and rubs together. (Get your mind out of the gutter!). If you don’t like the stick, try anti chafing thigh bands. 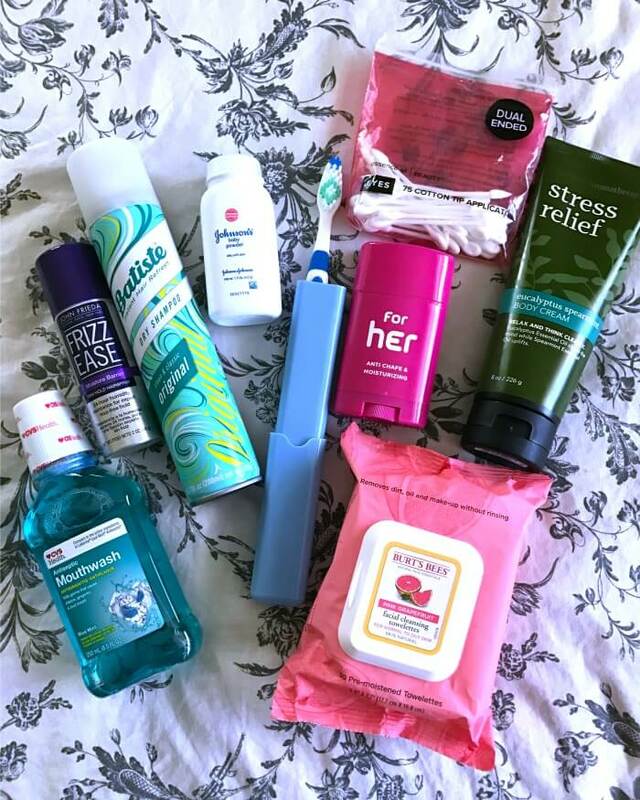 Shampoo/conditioner/soap/face wipes – All the cruises I’ve been on offer shampoo and soap, but not all have conditioner. If you’re like me and are very partial to your own, get small bottles that you can pour your favorites into and bring along. I really like these face washing wipes too, as it’s sometimes difficult to wash your face in the small cruise ship bathrooms. Razor – I bring a disposable and toss it at the end of the trip. Easy peasy! Dry shampoo – if you don’t like to shower or wash your hair every day, a small can of dry shampoo is a great addition to your cruise packing list. Perfume/cologne – I personally feel naked without a spritz of perfume in the morning, so I like to pack a travel sized bottle. Just remember you’re sharing a close space with a lot of people, so be sparing. Hand sanitizer – there’s a whole lot of people coming off airplanes full of recycled air. Sanitizer is your friend. I also like to bring Clorox wipes if I’m flying. Planes are gross, yo. Q-tips – if you’re a q-tip junkie like me, definitely pop a few in your bag as they’re not generally provided in the bathrooms. Flat iron/curling iron – I love my mini flat iron, it’s perfect and small and works great. There are mini curling irons too! Hairbrush – I’m addicted to my Wetbrush, so thankfully they make a travel one that folds in half and also a mini one! Hair ties/barrettes – I usually just buy a pack each of ponytail holders and barrettes and shove them in my bag. There’s nothing worse than bringing old ones and having them snap on you mid excursion. Lint roller– I like to carry a mini lint roller to get the travel dust and lint off my clothes. Earplugs – If you’re traveling with someone who snores (like me, oops…) ear plugs will help you get the sleep you deserve on vacation. 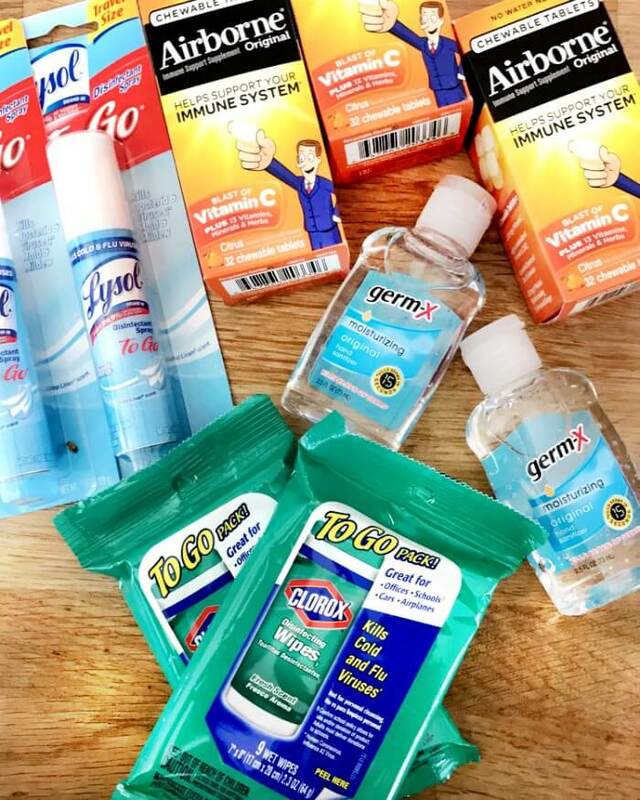 Your cruise packing list should definitely not skip medicines. You can get most things in the sundries shop, but they will be much more expensive than if you bring them yourself. Headache medicine – the stress of getting there, the airplane air, the lack of sleep the night before. It never fails that I have a headache the first day of any trip. I always carry my favorite headache medicines with me when I travel, and try to remember to drink a lot of water! Ginger pills – ginger pills are my first line of defense that almost always works – doesn’t cause drowsiness and has no drug interactions that I am aware of. Bonine – Bonine pills are the second level of defense, works really well and doesn’t generally make you sleepy – you’re not supposed to drink alcohol with this. Dramamine – Dramamine pills will likely make you very sleepy, but it works well. You also should not drink alcohol while taking Dramamine. 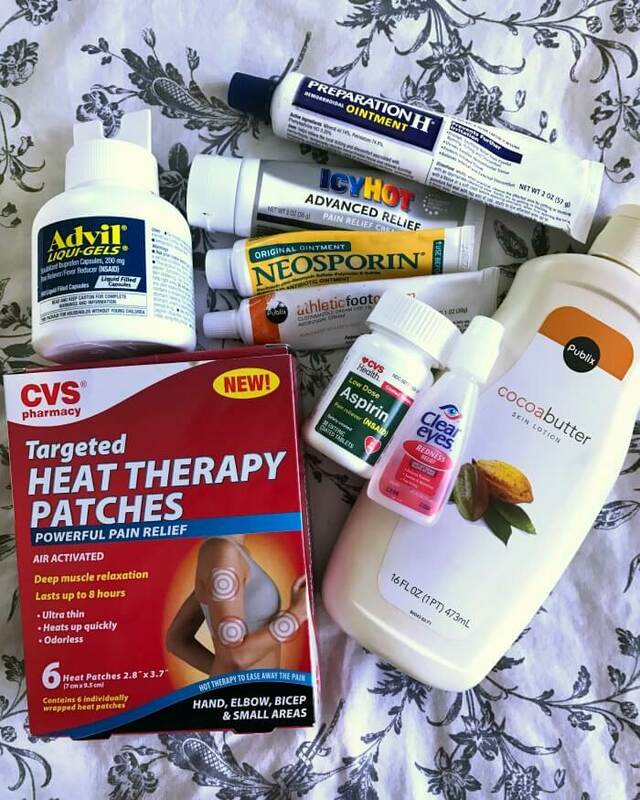 Sea sickness patches – this is a prescription defense. I usually bring a few from my doc in the event that we’re going on a long boat excursion that may be rocky. Make sure to ask for these several weeks in advance because they can be hard to track down during cruise season! Some folks who are sensitive to motion will wear them the entire trip. I have never found this necessary. Zinc/vitamin C – I’m always on the offensive when we travel since it seems like Murphy’s law that as soon as you leave work you get a cold. Knock on wood, we’ve been able to stay pretty healthy on recent vacations, but I always travel with zinc and vitamin C chewables or gummies. Daily medicines – make a list of anything your doctor wants you to take while you’re on the ship, or medicines you use regularly. Be sure to have your prescriptions filled well in advance of the trip. Phone – Don’t forget your phone!!! And don’t forget to call your cell phone provider to let them know you’re going on a cruise. They will run you through the options available depending on where you’re going and what cruise like you’re taking. Also, make sure to back up the data on your phone before leaving. Selfie stick – It’s nice not to have to ask people to take pictures for you! I love tucking a selfie stick in our day pack. And this one doubles as a tripod! Camera – I’ve actually found that I take more pictures with my iPhone than anything else on our last few trips, but I do still love to bring my DSLR camera for some of the special moments or really incredible landscapes. I always travel with the 40mm pancake lens because it’s small but takes beautiful pictures. Video camera/GoPro – Again, for most folks a cell phone video camera will suffice, but if you’re going to do some off road adventuring, a GoPro would make a nice addition to your cruise packing list! Tablet/e-reader – I like to bring my mini iPad or Kindle Fire and download a few movies, books on tape, and ‘paper’ books, so I have lots of options when hanging out on sea days. There’s lots of things to do on a cruise ship, but honestly my favorite is just to relax. Laptop – Believe it or not, wifi on ships has gotten downright decent. I usually work while we travel, so bringing a laptop and not getting behind on work has been great for me. I use a Surface Pro 4 and love it probably an inappropriate amount. It’s about the lightest computer you can get and works just as well as my big monster of a desktop. I recommend this computer to absolutely everyone, but especially if you have to travel with your computer. 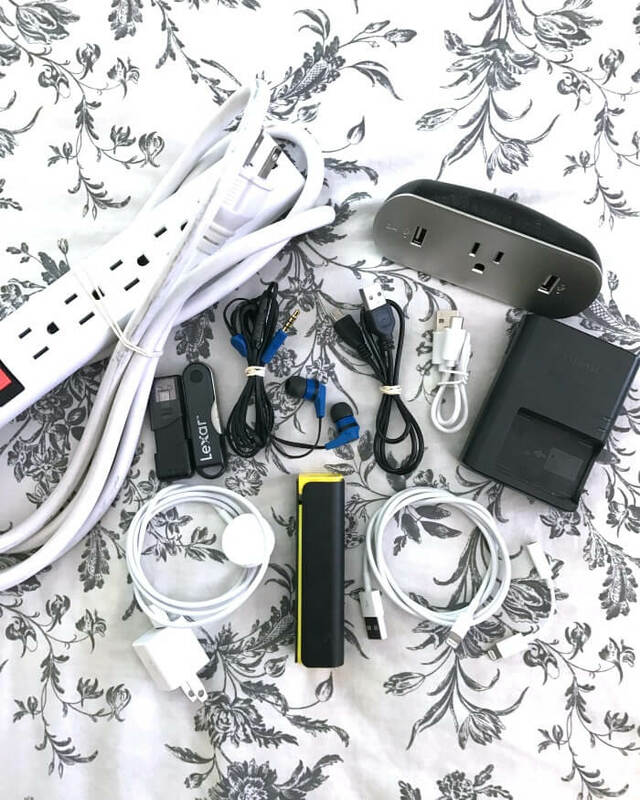 Charging cables – review all the electronics you’re bringing and make sure each one has it’s proper batteries and charging cables. Extension cord – There are very few outlets in a cruise cabin, so extension cords with multiple outlets come in very handy. Make sure to read the rules for your ship though, as some do not allow certain extension cords anymore. USB adapter – Most cruise ships have not added USB outlets into rooms, so you will want to bring your own USB adapter/outlet. Some extension cords have them incorporated, but I like to bring mine separately so I don’t have to drag the extension cord along with me if I want to plug in elsewhere. Rechargable battery pack – if you take as many pictures and videos as I do, you’re going to need to recharge your phone during the day. These battery sticks come in super handy! Or if you’re looking for more power (perhaps to keep a laptop going), we like this power bank. Earbud/headphones – I’m an earbuds fan, but either way, make sure you have earbuds (these are my favorite brand) or headphones with you to listen to your music, movies, and books on tape! Blue tooth speaker – we love to travel with our portable blue tooth speaker. Listen to your favorite music together on your balcony, on the beach, or in your stateroom! Mini printer – This is purely for fun, but how awesome is this mini printer that allows you to print your pictures on the go. I love it for quick scrap booking, note taking, and sharing memories with friends. SEE ALL TRAVEL FAVORITES IN OUR AMAZON STORE. My cruise packing MO is to use a camping backpack, with a folded up day-pack attached to the outside (this fits in an overhead compartment), and a crossbody bag (for under the seat) that holds my laptop and items I want accessible on the plane. This keeps your hands free for holding hands, coffee, and high fives. Complete list of my favorites below. Camping backpack – This is the camping backpack I have been traveling with for the last several years. It fits perfectly in an overhead compartment and has lots of great pockets and zippers. I even bought a second one for the hubby! Crossbody bag – My crossbody bag is a little bit more feminine than this one, but it’s similar to this and works great to hold my laptop and other items I want easily accessible. Personal item suit bag – You can’t very well shove a suit in a camping backpack, so we use this suit bag that fits under the seat and can be carried onto the plane as a personal item along with your overhead item. Wes is able to fit his suit along with a laptop and snacks. 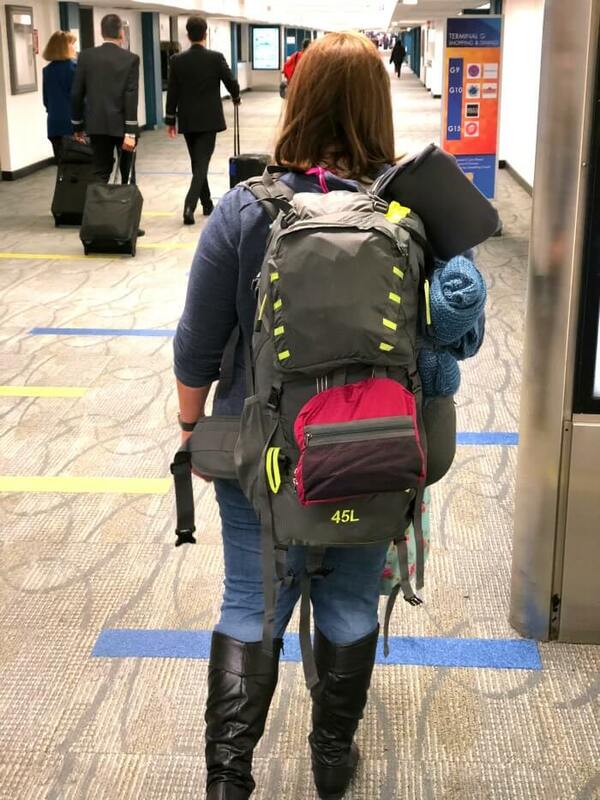 Day pack – I actually use this day pack every single day (and love it), but it’s especially nice for traveling because it’s super light and folds up into itself. On travel days, I fold it up and clip it to the outside of my camping pack or suitcase. Under seat wheeled carry-on – I don’t have one of these wheeled carry-ons that fit under the seat, but they’re all the rage and I have to be honest, I’m tempted to grab one for the times I travel alone. Packing cubes – We love our packing cubes. They’re great for keeping your clothes and travel items sorted. And bonus, these packing cubes will compress your items so you can pack more! Zippered pouches – Zippered pouches come in so handy when traveling, perfect for toiletries or to use as a wetbag while out on excursion. Refillable bottles – If you’re really partial to your own soaps and shampoos, silicone refillable bottles are a great option. Waterproof cell phone bag – I love these waterproof cell phone bags. They seem really basic and rudimentary, but they work perfectly and I love that they have a strap to hang around your neck. Fanny pack – I couldn’t be happier that fanny packs are back in style. They’re so convenient. When we’re in the ocean or on a wet excursion, I put my valuables in the waterproof cell bag and then put it all in the fanny pack and don’t worry about it getting wet or falling off when I dive in! RDIF wallet – If you’re traveling in heavily populated areas, especially train stations, bus stations, and airports, an RDIF walled that shields people from remotely stealing your information is a great investment. Insulated coffee mug – This coffee mug is my favorite! I’ve had it for years and it goes on all our trips with us. The handle is a carabiner style hook, the lid is tight, and it is vacuum insulated so your drink stays hot or cold all day long. Insulated water bottle – I’m obsessed with this water bottle, we take it everywhere (seriously, I even take it to my office every morning). The cap stays attached so you never lose it, and it keeps ice frozen for a full day. Literally! Magnetic hooks – You wouldn’t know by looking at them, but the walls on a cruise ship are metal, which means magnets stick to them! 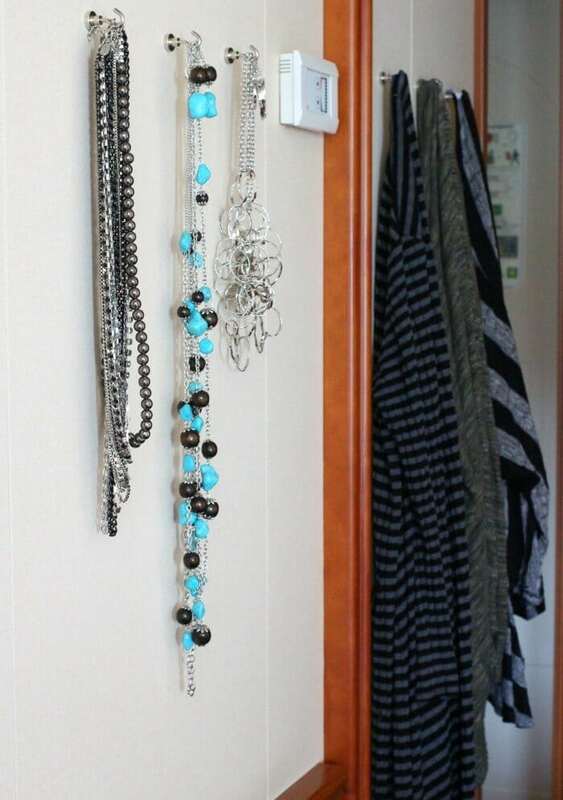 I like to bring a bunch of heavy duty magnet hooks to hang up jewelry, cardigans, swimsuits, and whatever else we want to keep off the floor and easily accessible! Neck support pillow – If you’re flying or making a long drive in, this neck support scarf/pillow is everything! I love that it takes up almost no room and can be velcroed to the outside of your carry-on. 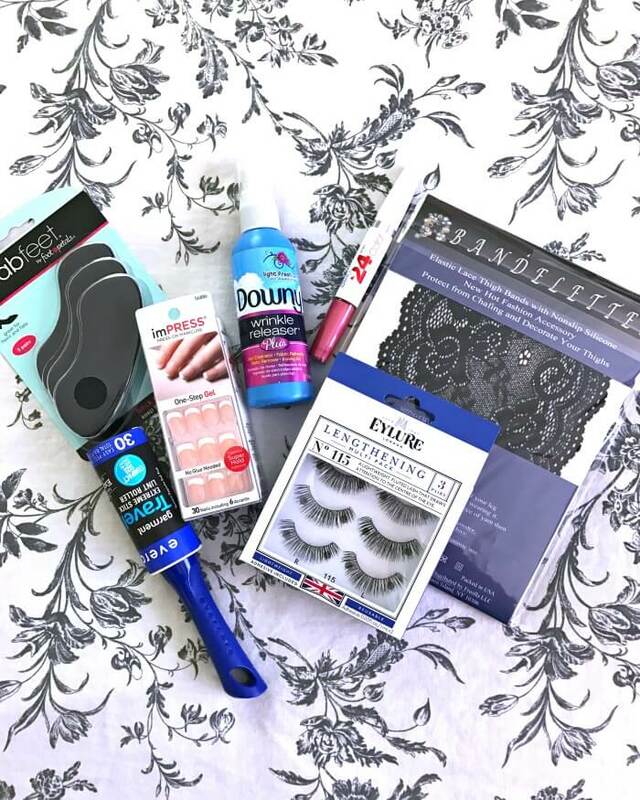 There are a few other things to consider for your cruise packing list if you’re going to a tropical destination, these are the extras I like to bring. Swimsuit cover up – You’ll be doing lots of swimming, beach activity, and hanging by the pool on these cruises, so make sure to get yourself a cute swimsuit cover up. I love this one and it comes in lots of colors! Beach blanket – We love our round beach blanket. It’s about the thickness of a sheet, so it folds up nice and small, but it keeps you from getting sand in your bum. Also, it’s pretty. Bug repellent – Bugs abound in the tropics and worse than the itchiness, they can actually make you sick. So be prepared with travel friendly bug repellent. Sun dresses/t-shirt dresses – I like to pack a couple extra light weight summer dresses, perfect for tossing over a swimsuit, or dressing up with a little jewelry and makeup. Wide brimmed hat – You won’t be wearing this on deck (too windy!) but it’s nice to have a big floppy hat to shade you from the sun if a little extra room in your luggage. Light scarf or shawl – I love this pashmina (mine’s pink!) because it’s great to cover your shoulders in air conditioning (or if you visit temples and churches), use as a quick beach blanket, or dress up your dinner outfit. Warm socks – It’s chilly in Alaska, even in the winter! Keep your toes warm with wool blend socks. Beanie – My Canadian friends kept correcting me that it’s actually a tuk (took? ), but whatever you call it, keep your head and ears warm with a knit cap while you’re cruising up north! Gloves – Nothing fancy, but bring along a pair of knit gloves – and make sure they have touch screen ready fingers so you’re not pulling them on and off to take pictures. That glacier ice is cold! Scarf – I like this pashmina style scarf because it can double as a blanket, or this infinity scarf that has a hidden zippered pocket. Fleece leggings – Fleece lined is super warm, but even regular leggings are great for adding insulation to your outfit when you’re walking on a glacier or canoeing in Alaskan waters. Waterproof windbreaker – I actually love this windbreaker for almost any trip, but it’s an absolute must-have for Alaska and cold weather cruises. I sized mine two sizes up so I could wear a sweater underneath if need be. Hand warmers – I keep a few of these air activated hand warmers in my pockets whenever we’re traveling somewhere cold. They last for several hours and can be a lifesaver for frozen fingers! « Vancouver – Everything to Do in Vancouver! Can not believe you just did backpacks!! Good for you! Great list to be prepared and have what you need. backpacks are the best way to travel!!! Nice job on the packing list! I also pack binoculars. On our Alaska cruise we saw whales, porpoises, birds, seals, bear, and mountain goats from our balcony, the deck and the Skagway train. Have done it twice…the first time I ended up buying binoculars on the ship. Happy travels! Thanks for the great checklist. I’m going on a cruise this fall and wouldn’t have thought to have some sea sickness patches on hand. Great tips! An Alaskan cruise is on my bucket list. What a great adventure! Great tips. I’ve never heard of ginger pills. Writing it down. You go on the best trips!!! This looks awesome! my husband and I are taking a Bermuda cruise for our 10th anniversary – we can use some of these tips for that. Thanks so much for sharing!